Not only did Eric have many Laugh-out-loud evacuation adventures, in his retirement years living in beautiful South Devon he continued to get involved in many hair-raising mishaps and escapades. frequently on (and even in) water. 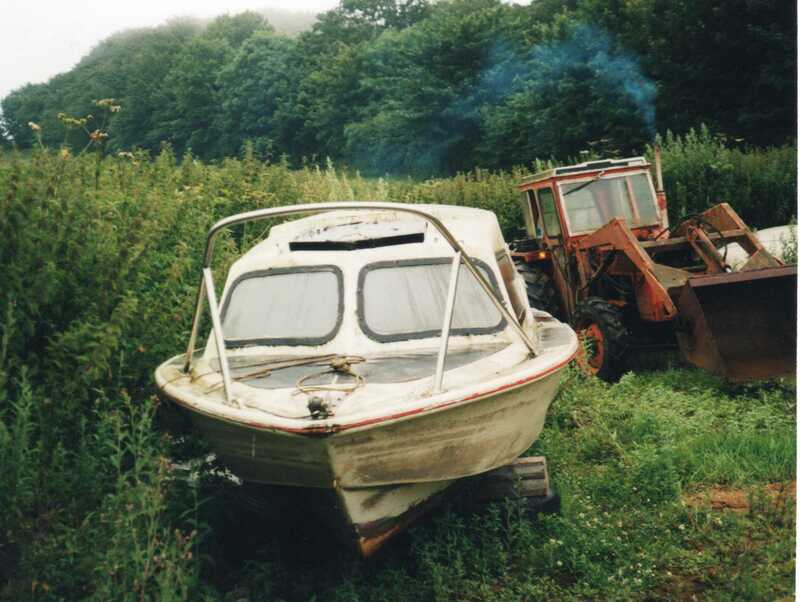 In the Spring of 2003, Eric saw a Harbour Master’s notice in the Dartmouth Gazette, asking for offers for a boat which had been abandoned in the town’s ‘Boat Float’; they needed it removed to reclaim the fees which had remained unpaid. Eric knew it was a better boat than the one we already had, as it had a cabin and was more suitable for seagoing fishing trips, so he put in a very low tender and it was accepted. 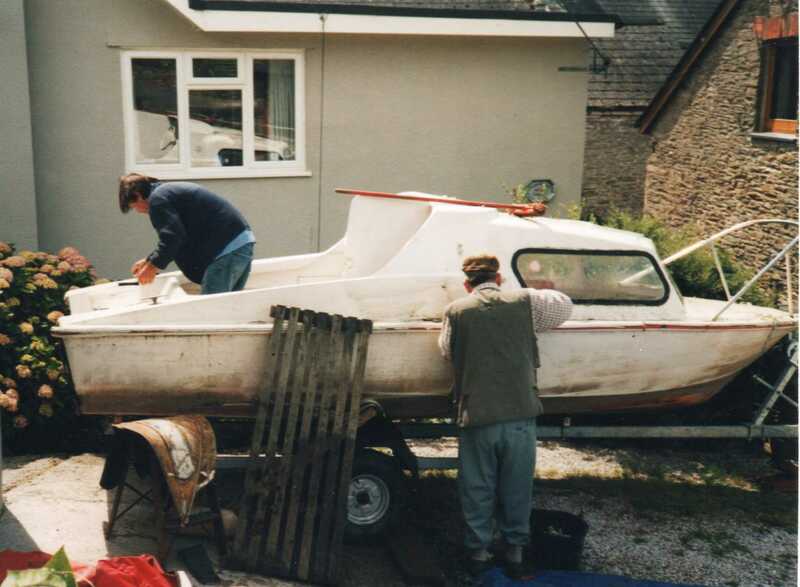 Shortly afterwards, together with his fishing mate Steve who knew a lot about boats and was good at restoring them, Eric went into business buying up and making good abandoned small boats and selling them on. A real piece of luck was that a nearby farmer was renting out barn space for boatbuilding or similar crafts, so Eric and Steve aka ‘SEBCO’ (Steve & Eric’s Boat Company!) rented space very cheaply and set up a small workshop. When renovated and launched, the boat Eric bought in Dartmouth looked very smart indeed, repainted with a good engine and new seats etc. 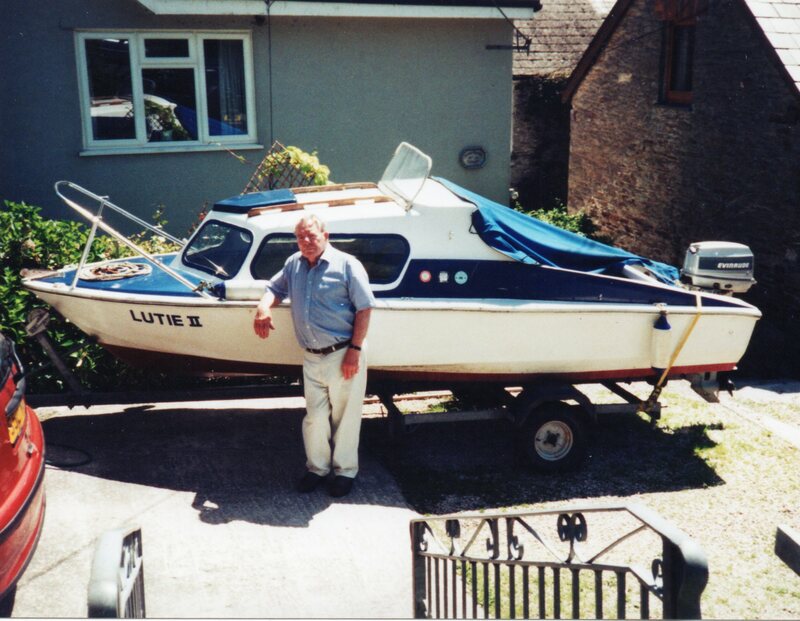 Eric named it ‘Lutie II’ as the name of our original boat had been named ‘Lutena’ and had been the second boat to be named after me, the first one being a river cruiser made by boatbuilder friends in Henley-on-Thames. They later built a splendid old-style Steamboat on which I twice celebrated landmark birthdays entertaining friends in the beautiful wood-panelled cabin. One afternoon Eric and Steve went fishing in Dartmouth and found themselves unintentionally drifting out to sea. Eric was enjoying himself until suddenly the engine cut out and Steve struggled for a while to revive it. They were drifting towards a small cove with figures on the beach so, when in shouting distance, Eric called out ‘Has anyone got a screwdriver?’ This caused great consternation and Eric felt the people were displaying a very unfriendly attitude turning their backs – which was unsurprising, as it happened to be the only Nudist Beach in the area. Just thought that I’d Google dad’s name and this came up. Haven’t read this before and it made me smile.